For some reason my MySQL database keeps crashing (grrr!). My site was also down pretty much all day yesterday due to some kind of power outage… Combined with crappy .htaccess file support I’ve had to hack my way around it’s clearly time to switch hosts! Somehow I got over 400 visitors on Friday which I can only attribute to my Tekzilla segment which was just released that afternoon. Wow, thanks for checking out my site everyone! Sorry there isn’t much here. I started working on this site a couple of years ago when I was just getting back into programming websites and I wanted to teach myself PHP and CSS and also try out WordPress. Now years later it’s still a woefully out-of-date work in progress, and I really have no excuse except that it never really seemed to matter much. It sort of does reflect quite poorly on a freelance web programmer though, doesn’t it… Shameful! This website also doesn’t reflect it at all but I’m also just getting into the audio/music production business. I’ve partnered up with Colin Fairbairn, mixer extraordinaire, whose website you can check out at sfrecording.com (half that studio gear is mine!). We freelance at local studios for recording projects and are otherwise taking on mostly mixing projects as we look for a space to set up shop. Look out for some “how to” home recording videos from us in the future! Anyway thanks to everyone who wrote in to tell me that I did not in fact make a complete fool of myself in my first video on the interweb (or on anywhere, really). You are all very VERY kind people and I really appreciate the support! Having now watched it myself I guess it was more or less okay, though I definitely need to work on being WAY less nervous so I can speak naturally instead of being all rambling and halting and wooden. Maybe you’ll see me again on the show. Maybe. But that is all boring stuff. 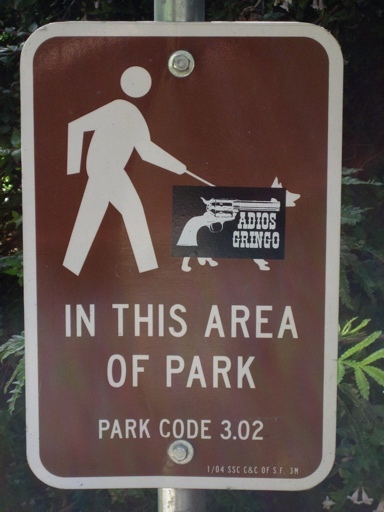 What’s interesting is this funny sign from the Golden Gate Park. Yup, another person checking out your site after the Tekzilla episode! I was wondering if you could illuminate on whether there is a similar imap type service? I don’t want to delete the mails from the webmail addresses, just read them more conveniently on my mail apps. Thanks and hope to see you on Tekzilla again soon! Hi Sukumar, thanks for checking out my site! I unfortunately don’t know of a similar application that provides an IMAP interface, but if it’s just a matter of not wanting the emails to be deleted from your webmail account you can do that by configuring your email client to leave the messages on the server. Sukumar, if you’re running a Mac or Linux you can install dovecot which is a popular open source IMAP server then use fetchmail to pull down the mail from other providers. Probably a silly idea to run your own IMAP server unless you’re a super nerd. I’d suggest just using a free service like Gmail that already has IMAP support and forward all mail to it. It’s free, reliable, and easy. Actually pulling mail from your webmail accounts via fetchmail (through POP3 via FreePOPs) to your own computer and then running an IMAP server will only give you the IMAP interface to the mail on your computer, but won’t do anything in the way of syncing your webmail accounts to your local mail. Configuring your POP client to leave mail on the server won’t sync your email up the way IMAP does but it at least will still let you access your email from your old original webmail interface AND your email client.